Mickey, the black squirrel with ingrown teeth I took care of for a few months earlier this year, has died. Mickey had increasingly worse seizures and wasn’t responding to medicine, the wildlife rehabilitators who took her in said. Eventually they sadly had to euthanize her. Mickey came to me from Peter Richter, a hawk-watcher and blogger, who knew Mickey as a cheeky character at a Queens community garden. Mickey took nuts by hand, much braver than her squirrel companion. Mickey tried to fight off a red-tailed hawk and ended up falling. My theory was that she broke her top teeth, which her big bottom teeth need to grind against. Peter nervously watched her decline and brought her to me just in time. 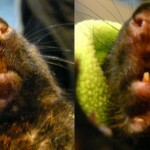 She was cold, had lost weight, was covered in mites and her bottom teeth were growing into her top gums. I clipped her teeth and she regained her strength eating mushy foods like avocado. Hey, Let’s Take All the Unpopular Raccoons and Move them to NYC Parks! Which would you rather have the NYC health department spending its limited resources on? Preventing rabies in one of the world’s busiest parks–or providing some old ladies in the practically suburban part of Queens with a free pest removal service? 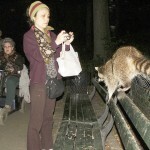 Keep reading Hey, Let’s Take All the Unpopular Raccoons and Move them to NYC Parks! 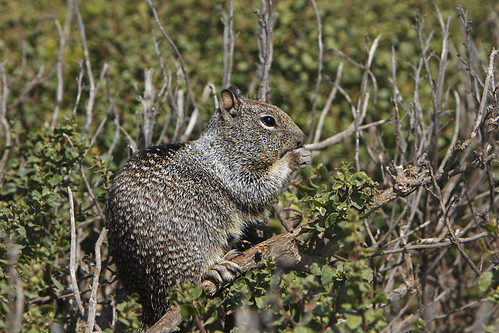 When you actually go out to look, these husky-sized ground squirrels aren’t so easy to find. 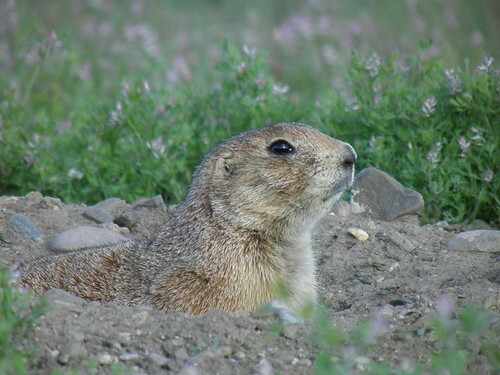 So, if you’re an easterner headed to Montana, check out the Greycliff Prairie Dog Town a couple hours outside Yellowstone National Park. Bill the SoHo groundhog is now Van Cortlandt Bill. The grumpy little woodchuck was found mysteriously wandering around West Broadway in lower Manhattan a few days ago. The workers at the SoHo Grand did a great job of catching him (no easy thing to do) and finding a wildlife rehabilitator (me). Normally wildlife rehabbers take in animals that are injured, orphaned or sick. Bill was just in the wrong place, somehow transplanted to a neighborhood of concrete by humans. He was fine–aside from being ticked off at being in a cage. He enjoyed the apples, chestnuts and acorns I gave him, but let me know he had big teeth and knew how to use them. I just needed to find the right place to release him. In New York wildlife rehabbers are supposed to release the animal the region where you found it–in this case New York City. With the help of the city’s most prolific rehabber Bobby Horvath, I found David Kunstler, the wildlife manager for Van Cortlandt and Pelham Bay Parks in the Bronx. 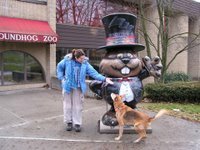 Groundhogs are found in both parks (and also Fort Tryon and Staten Island). Kunstler recommended Vault Hill, where the parks department is restoring a meadow. Bill got very excited as soon as he realized he was near the wild. He tried to chew through the carrier bars. When I opened the door, he sat there stunned for a minute, but then happily took off. The entertaining part of being a wildlife rehabilitator–aside from aside from all that helping animals whose lives have been thrown off course by humans–is the crazy phone calls. Right in Manhattan I’ve gotten calls about “a bird someone told me is an eagle,” a baby skunk, a few possums, a handful of raccoons and pretty much every baby bird one neighbor ever sees. Today I got call from the SoHo Grand–a hotel more known for celebrities than wildlife–about a groundhog they found out on West Broadway. In what little experience I have, I have learned that New Yorkers do not know their animals. Every call I get for a baby squirrel, I fear I am going to pick up a rat. 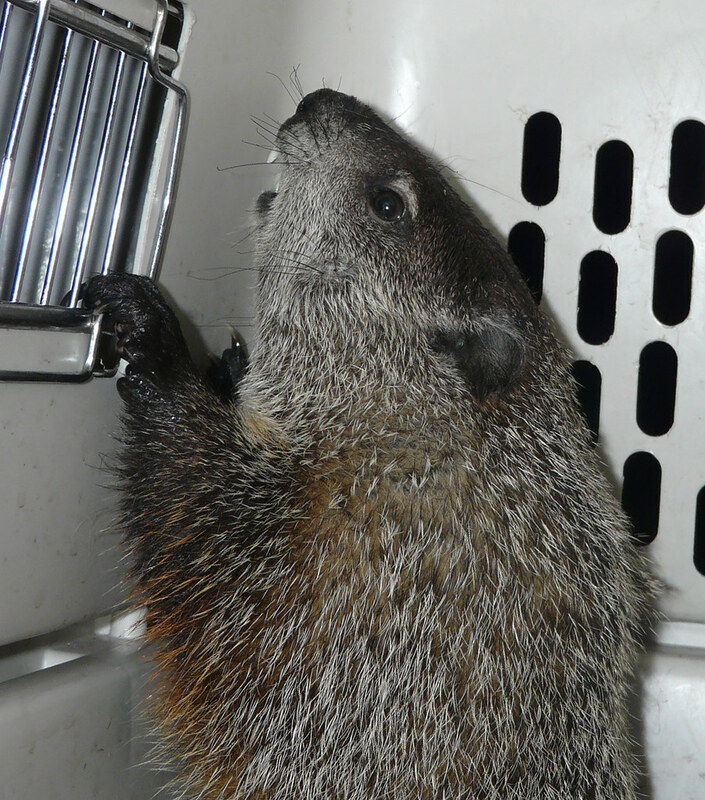 But, much to my amazement, tonight I have a Manhattan groundhog sitting in a dog crate in my living room, awaiting release. 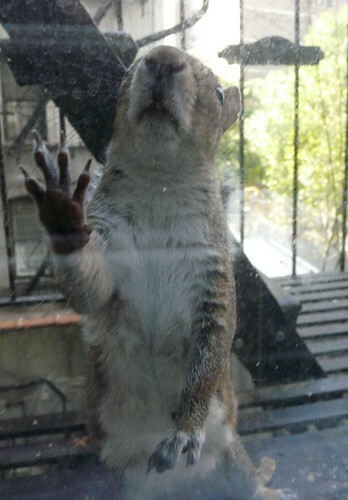 The people at the SoHo Grand couldn’t have been nicer–to me or the marmot. They captured her (or him) off the street, despite the animal’s screaming, because they figured leaving her there would be cruel. (They used to call them whistle pigs.) They gave her a nice crate, water, carrots and apples. Their theory was that she climbed into somebody’s trunk, then unwittingly stowed away into Manhattan. There was some speculation that she had somehow escaped a Chinatown kitchen. Groundhogs can move faster than you think, but I doubt one could make its way into Manhattan like the coyote. I’m in my third week of antibiotics after returning from a trip from New Hampshire with a textbook bullseye surrounding a tick bite. Which animal should I blame? The New York Times let five biologists and entomologists debate the issue. The first guy out, Thomas Mather, professor of public health entomology, gave the answer that has become commonly lore: deer. The premise: Deer populations have risen along with lyme disease cases. But then other scientists basically cast some reasonable doubt on the case against the deer. Ixodes scapularis, commonly known as deer ticks, bear ticks or black-legged ticks, can pick up the bacteria that causes lyme disease from a whole range of animals, not just its namesake. The American Lyme Disease Foundation calls deer this species’ “preferred host” but notes that mice are the primary carriers of the disease, which can also be spread via birds, dogs, cats, horses, squirrels and other small mammals. Richard S. Ostfeld, of the Cary Institute of Ecosystem Studies, notes that the incidence of lyme disease and deer don’t correspond, but that acorn crops (which feed white-footed mice) do. William L. Krinsky, entomologist at Yale’s Peabody Museum, says we don’t have enough data to understand how much blame rodents and deer should get.